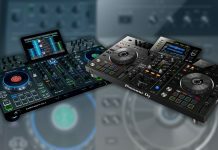 Bottomline: The best Pro DJ controller for Rekordbox at this moment, period. I was looking forward to see the DDJ-1000 in the flesh, and honestly, it doesn’t dissapoint. It’s easy to become indifferent of new gear when you see as much of it as I do, but this new unit from Pioneer DJ really is something special. 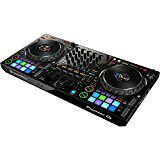 First of all, the design is clearly aimed to mimic a full CDJ/DJM setup, with the mixer standing out with its black glossy finish (fingerprints alert!). Secondly, the jog wheels are fantastic, and the center LCD screen crips, clear and contains all you need to play without having to look at your laptop. I was expecting that there would be some support for library browsing as well (it’s hard, but it’s possible in my opinion to display a scrolling list of tracks on the limited space the screens offer) but unfortunately no, you have to fully rely on your laptop for browsing your tracks. The lack of FX controls on top is a bit weird at first, but having the effects on the mixer feels so much more logical and aligned with the DJM mixers that you forget about the change quickly. And oh, the beat effects don’t need Rekordbox to function, so if you connect a pair of turntables you have a full working mixer, including sound color and beat effects! Pioneer DJ has delivered a truly great piece of equipment. For DJ’s that want a compact unit for home use that feels almost exactly as a bigger and much more expensive CDJ/DJM setup, this is it. At USD 1.199, Pioneer launches a frontal attack on its competition. 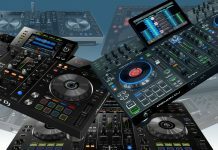 I hope to have the DDJ-1000 in my studio for a detailed review in the near future, keep an eye on DJTechZone for that! 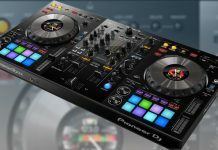 Pioneer DJ DDJ-800 Rekordbox DJ Controller Launched! Pioneer DJ XDJ-RX2 Versus Denon DJ Prime 4: Which One Wins? Get our FREE 25 page PDF guide on how to get starting with DJing in 2019! Djtechzone.com is a participant in the Amazon Services LLC Associates Program, an affiliate advertising program designed to provide a means for sites to earn advertising fees by advertising and linking to Amazon.com.